Tyrannosaurs, Triceratops and Pteranodon, huge dinosaurs, turn up all of a sudden in Tokyo, and go on the rampage. They writhe in agony as if they were revolting against something, and destroy towns one after another. In fact, those dinosaurs are being controlled by "Evolion", an evil invading army. "Evolion" is ruling "Dino-earth", another planet earth separated from our earth 65,000,000 years ago due to bump with colossal meteorite. 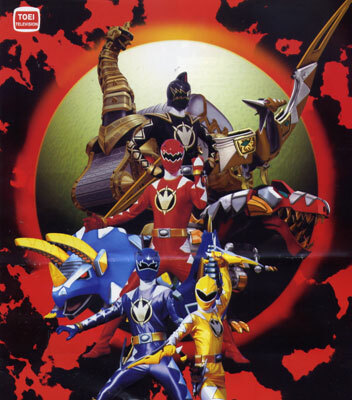 Originally, evolved dinosaurs named "Bakuryu" and the human race named "Ryujin" (Dragon People) coexisted peacefully on "Dino-earth", but it was invaded by "Evolion" an evil army. And this time, "Evolion" has invaded the earth through the Gate of Space-time in order to conquer us. On the other hand, a young man named Asuka, comes to this earth. He is "Ryuijn". He looks for humans of this earth who have "Dino-guts" with which they can come to a mutual understanding with "Bakuryus", in order to release "Bakuryus" from the yoke of evil control, and to make them fight against "Evolion" with him. And now, young men who have strong "Dino-gets" heard the cries of "Bakuryus" and get together. They are Ryoga, Yukito and Ranru. When they hold "Bracelets" given by Asuka up over their heads, they can transform themselves into Dino Red, Dino Blue and Dino Yellow, and "Bakuryus" can regain their original righteous characters. © 2003 Toei Company, Ltd. All Rights Reserved. Licensed by Animation Int'l Ltd.